Let's just say, it's been a crazy FROZEN themed month here. Two birthdays, two winter storms, and a whole lot of days off of school has equated to many Frozen themed crafts, hours upon hours of pretending to be Elsa & Anna, and countless replays of the Frozen soundtrack . It's a good thing I like the movie as much as L and E do. 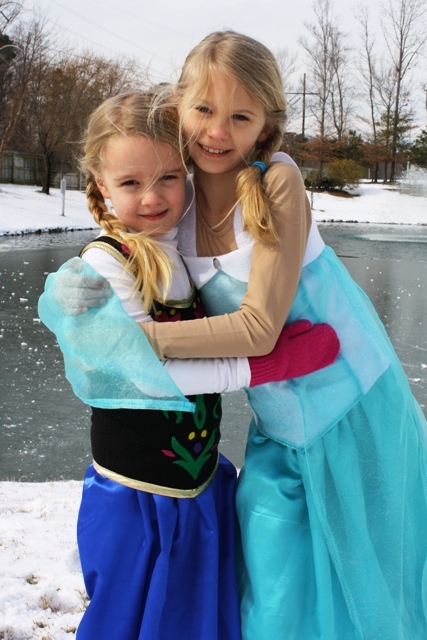 A few weeks ago, my sister Jessica asked me to try my hand at making Anna & Elsa costumes for her blog. Well, I love a challenge so I said I'd give it a whirl even though technically I hadn't even seen Disney's Frozen yet. I knew the basic plot from the Frozen Read-Along Storybook and CD that Lu got for her birthday and I'd heard the soundtrack since the girls got it for Christmas. Saying "yes" to Jess was a good excuse to take the girls to see the movie. It was a rare treat for us. So much fun! After watching the flick, we headed over to Joann to pick out some fabric to make the costumes. After some doubting whether or not I'd be able to pull it off, I managed to make costumes for both of the girls rather inexpensively. They've worn them so much already, that I think we've gotten our money's worth out of them in the last week. You can find the tutorials over at Life as MOM. Check out the DIY Anna Dress-Up Tutorial here and the DIY Elsa Dress-Up Tutorial here. Well, wouldn't you know it, right around the time I was working on the costumes, we got some SNOW! While I finished up the costumes during the snow day, the girls cut out paper snowflakes. Our walls are now adorned with many, many snowflakes. I was amazed at how diligent Lu was at making her creations. It's fun to see her develop that creative side. It wasn't too long ago that she wouldn't draw a picture on her own. On Sunday, Ella's birthday rolled around and we had some family friends over for a combined party for the girls. It. Was. Chaos. Controlled chaos, but chaos nevertheless. 14 kids in a 2-bedroom condo is quite a lot to handle. But, no one got maimed during the pinata busting so all was good. Last night, Winter Storm Leon blew on through, so now we've got another 3+ inches of snow. Since Williamsburg is not really equipped to handle snowfall, we had another snow day today. My guess is that tomorrow will be the same. If that's the case, I'm sure the Frozen fun will continue tomorrow as well.